The video shows a Turkish ice cream vendor royally teasing Aamir Khan while serving him ice cream. Who knew learning life lessons could be this delicious! A video recently posted by actor Aamir Khan shows him learning first hand that sabar ka phall is meetha or that good things come to those who wait. And boy does this little lesson look fun or what! And why wouldn't it? It involves ice cream. You may have seen those viral videos of ice cream vendor's tricking their customers while serving them ice cream. This time the customer was none other than the Dangal actor. 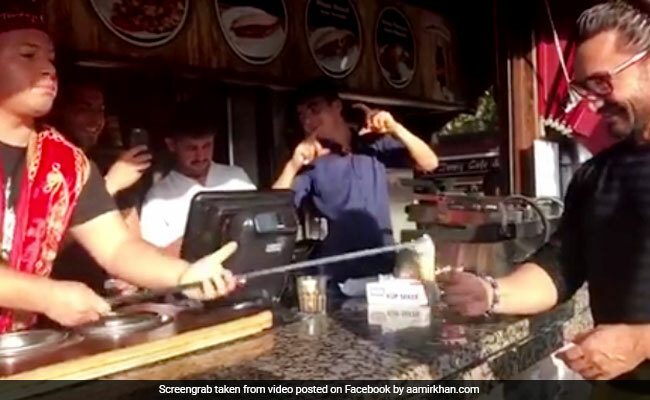 Aamir recently posted a video showing a Turkish ice cream vendor royally teasing him while serving him ice cream and the video has gone totally viral. "Sabar ka phall meetha. Lovely Turkish ice cream," posted Aamir on Twitter and Facebook on October 7. His video has since accumulated one lakh 'likes' and almost 20,000 retweets on Twitter and over 6.1 million views on Facebook. No one likes to wait for ice cream but when the wait is this entertaining, no one would mind. Social media seems to have really enjoyed Aamir's video. "Amazing to watch Mr Perfectionist getting amazed," says one Facebook user. "That was entertaining!" says another.